Are you thinking of filing for divorce, but don’t know who to turn to for advice? Turn to the lawyers at The Law Office of Doppelt and Forney, APLC. We are here to provide you with clarity, manage your expectations, and represent you if you choose to hire an attorney. We practice in all aspects of family law including divorce, legal separation, child custody and visitation, child support, spousal support, and more! Call today to schedule a free consultation. If December is engagement month, January is surely divorce month. It’s a new year, which means a fresh start. A clean slate. A new you. Although studies show that more divorces are filed in March and August, the spike begins in January. Do you need a top San Diego family law attorney to assist you with your prenuptial agreement? Are you not sure if a prenuptial agreement is for you? 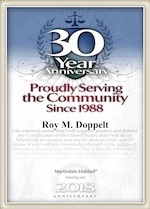 Trust the attorneys at The Law Office of Doppelt and Forney, APLC to protect your rights. Call today at 800-769-4748 to schedule a free consultation with an attorney. While getting a prenup might not be the most romantic thing to do during your engagement, it might be one of the most important things you do. Yes, even more important than your venue, flower arrangements and wedding cake. A prenuptial agreement, or a prenup, is a legally binding contract created by two people before they get married. A prenuptial agreement addresses separate property, property acquired during the marriage, and the rights each spouse has to the property if they divorce.